A writer named Jacqueline Arias wrote an article for Preen about my current favorite local female celebrity - the other half of my most favorite love team - Nadine Lustre. The title was a total click-bait: How To Be Nadine Lustre. Of course, her younger supporters (those aged between 13-20) would most likely read it in the hopes to become as talented and successful as she is. As for us not so young ones, we read it because we love her. We want to know everything that's written about her. But no, it's nothing about her being a loving daughter or an awesome artist. The article was full of negative crap. Did the writer know that Nadine navigated the drone used for the amazing top shots in On the Wings of Love when they were in Lake Tahoe? Has she seen the video N edited like a pro? Was she aware that N went straight to her mom in the hospital when she came back from the States? Did she know that N is also a budding fashion-preneur through Phosphene on Instagram? I only knew about the article when her gorgeous and talented boyfriend, James Reid posted on Twitter about it. I rushed to Google to search for that one hell of a write-up that made this calm, suave guy tweet his frustration. At first, I thought to myself that maybe James and my fellow Jadines are just overreacting. As I went further the following paragraphs, though, I felt uneasy. It was such an awkward trying-hard piece of satire. It was not satire even - it was a direct attack to belittle Nadine's personality and achievement as if Arias felt she's god. With fangirl disappointment, my curiosity led me to "researching" how this writer looks like. In my head, I was like, "you better be prettier than N or else..."
Bam - I saw her photos. Look for it yourselves and be the judge. I felt sorry for her. It must be sad to be in her shoes right now. I'm sure it would be hard to get writing gigs after the controversy. But most of all, it's sad to have a life of a hater. I read that she also wrote an article about Liza Soberano that has the same feels. Everybody loves Liza! Come on, how can she take to think of putting that angel in a bad light? Oh, some fans posted her photo with Kathryn Bernardo so maybe that's one reason. She's a diehard fan, who will waste her life to ruin others just to express her love for her idol. Typical. Both articles have already been taken down. Preen has also issued a public apology on their Twitter account. Jadines forgave (okay, some) but will never forget, I'm sure. 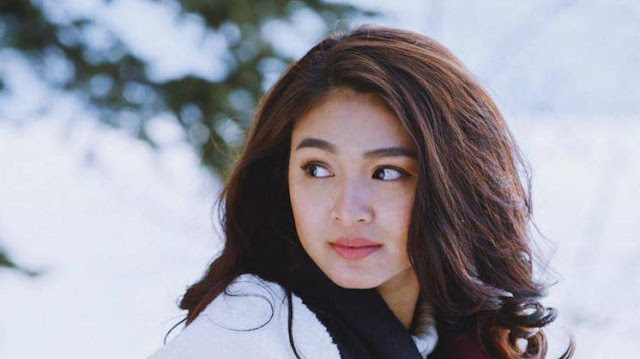 For us who hold true to our feminist cells, we felt like the article emphasized that women should work hard to be successful and beautiful not for herself but for her to snag a cute guy like James. Totally pathetic. Totally the opposite of being an alpha female that Nadine is. You may see screenshots of the article here. Please read it and tell me what you think of it. Today's the last day of International Women's Month. So allow me to empower you more, may you be a Jadine girl or not. Wear make-up, cultivate your passion, tone your body, sing your heart out, travel, dance crazy, and so much more of anything you want to do - FOR YOURSELF. Also, as James said, "If you wanna find love, be someone worth loving." How can inquirer ever made that kind of crap published? I mean, do they not proof read? It is obvious that the focal point of that narrative crap is to bash Lustre. I just want also to add na yes, nadine is not mestiza but she is pretty. Why would it be not possible that a guy can fall in love with her? The EIC made a statement in their Twitter account that it was supposed to be a satire article but obviously, they failed. They should have learned from the previous articles Jacqueline Arias wrote before - about Liza and Maine - and should have not commissioned her to do one again for Nadine. Right... And you know, if you see Arias' photo? She's morena! So I don't understand why she had to hit on Nadine's skin complexion. What a hater.